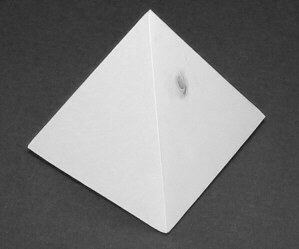 Welcome to the six inch flying Pyramid page. This kit is almost an exact replica of the nine inch except smaller. It is nice since it can be flown on both Aerotech and Estes motors. It is also a cost effective kit since it only needs one nylon parachute and a streamer for recovery. 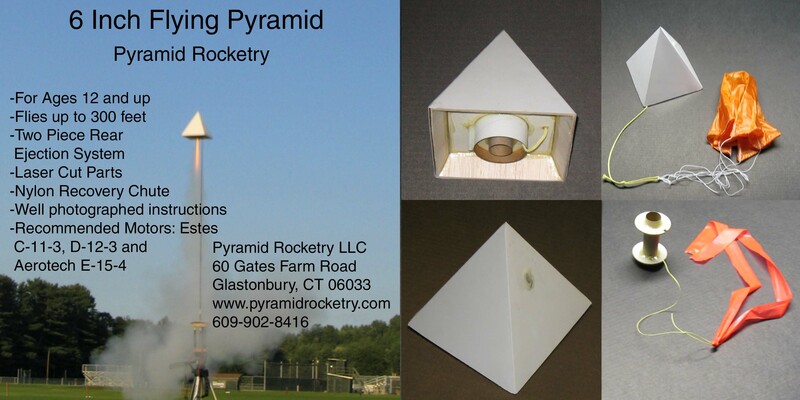 This is a great rocket for anyone who wants to experience a Pyramid without paying the premium price for the flagship nine inch kit. Basic Pyramid that flies on Estes D and E motors and Aerotech E.
Rear recovery system utilizing a 15" nylon parachute, a streamer and heavy duty Kevlar. The parachute and streamer are packed in between the centering rings. Flies up to 200 feet on Aerotech E 15-4 motors.